Home Blogging tips Vibrant vs Infolinks vs Kontera ~ Which in-text ad is better? 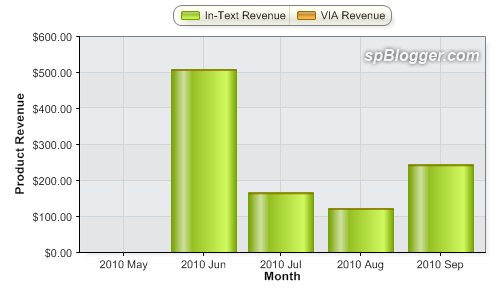 I started to publish Vibrant in-text ads on JayceOoi.com since June 2010. The first month performance was outstanding due to many big advertisers. However, earning dropped in the follow months. Luckily, back up from bottom last month. As for Infolinks, I still publish it on this blog. June earning == US$ 5.29, July earning == US$ 3.16, August earning == US$ 1.33 and September earning == US$ 1.08. Oh my, the earning is dropping each month. Will it drop below US$ 1.00 this month? Kontera… I did not try it again (because Kontera had a bad earning record) even after several emails from its business development manager. Why? I planned to try out Vibrant for a quarter then test out Kontera. Decided not to when I found out that My Tech Quest blogger regretted to switch to Kontera from Infolinks. Next articleIs Twitter a good marketing tool?